AIIMS Rishikesh B.Sc. 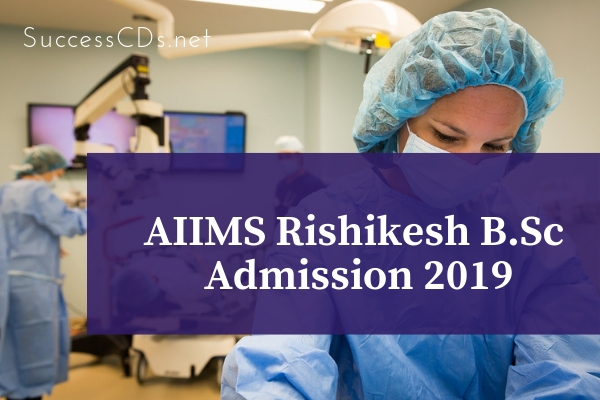 Admission 2019 - All India Institute of Medical Sciences, Rishikesh invites online applications for Entrance Examination to admission in B.Sc. Course in Dental Assistant and Dental Hygienist at AIIMS, Rishikesh for January 2019 Session. All India Institute of Medical Sciences (AIIMS) Rishikesh as an autonomous institution of national importance and defined its objectives and functions. Student should be competent to become partners in oral Health: (i) To assist dental surgeon in maintenance of dental clinic; (ii) To assist dental surgeon in sterilization; (iii) To enhance efficiency of dental surgeon by handling required instruments; (iv) To handle various dental materials and medications as required; (v) To be able to aid in the functioning and data maintenance of a dental clinic. Dental Hygiene Course Goals & Objectives include: (i) To provide appropriate dental hygiene therapy for patients with different oral health problems; (ii) To demonstrate social responsibility by initiating and participating in delivery of dental health care and education in community; (iii) To participate in a variety of interdisciplinary health care settings; (iv) To value personal, professional growth and life-long learning. Academic session commences in January every year. Selected candidates have to join with timeline indicated by Academic Section, AIIMS Rishikesh in offer letter issued to respective candidate. has attained or will attain the age of 17 (seventeen) years as on 31st of December of year of admission (2018). should have passed 10+2 or equivalent examination with English, Physics, Chemistry and Biology. has a minimum aggregate mark required in qualifying exam i.e. 10+2 or equivalent; 50% for Gen/OBC (45% in case of SCs / STs Categories) in aggregate in English, Physics, Chemistry and Biology. Applicants who are to appear in 12th class exam under 10+2 system or an equivalent exam in March/April 2018 and whose results are likely to be declared before 31st December 2018 are also eligible to apply. Applicants who are due to appear at qualifying examination, or have already appeared and are awaiting result, can also apply for admission. Admission will be made entirely on basis of performance of candidates at Entrance Exams To be conducted in AIIMS Rishikesh. It is hereby informed that if any applicant provided false information solely for purpose of appearing in exam for practice or other purpose, applicant will be debarred from AIIMS Rishikesh Exam in future. Entrance Exam For B.Sc. Courses will be conducted in Rishikesh only. Seats will be filled strictly on merit on basis of marks secured by the candidates in Entrance Exam Conducted by Institute. Entrance Exam will be conducted in English Language only. General standard of each entrance exam will be that of 12th class under 10+2 scheme or an equivalent exam of an Indian University/Board. No Syllabus for exam has been prescribed by Institute. There will be negative marking for wrong answers in entrance examination for all courses. Each correct response will get a score of +1 mark. Each incorrect response will get a score of -1/3. More than one response will be negatively marked. Zero mark will be given for questions not answered. Order of counselling will be General/ST/SC/OBC. Counselling will be done strictly by combined merit list starting from Rank No. 1. No candidate, in any circumstances, shall be allowed to join after 28th February 2019. Candidate should fill in Online Application with utmost care and follow instructions step by step. Candidate should fill in Online Application form correctly. Incorrect filled form may lead to rejection. Cost of Application Form includes fee for entrance exam which is non-refundable and no correspondence in this regard will be entertained. Candidates required to go through Prospectus carefully and acquaint himself/herself with all requirements with regard to filling of online application form. After selecting online registration, fill mandatory details asked for and deposit prescribed fee through NEFT/RTGS. After submitting fees filled required information step by step. Follow Instructions scrupulously. Candidates are advised to check final status of their Registration Form regarding images and eligibility and Admit Card which will be available on AIIMS Rishikesh Website www.aiimsrishikesh.edu.in as per schedule mentioned in the "IMPORTANT DATES AT A GLANCE".